It's officially spring, and my friends at The Blended Blog will be sharing some Spring Time Fun on Mondays during April and May. We hope you'll link up with us! A pretty raincoat. Make sure it has a hood, so you don't get drenched on those quick dashes from the car. This Topshop rain jacket is the perfect weight for spring, and has adorable pink piping. A small umbrella. 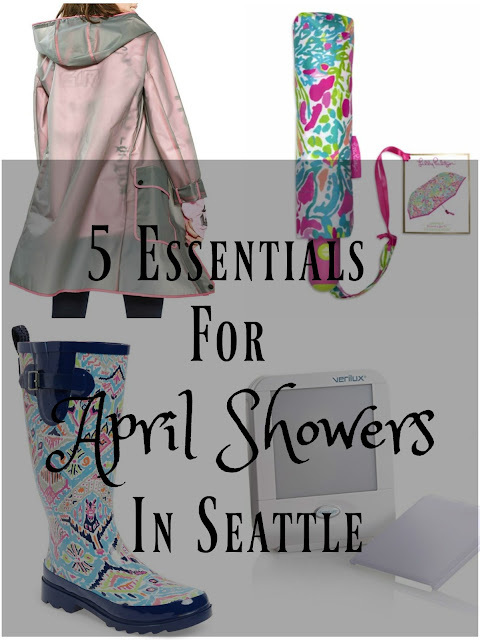 True Seattleites rarely carry an umbrella, because it's too much of a hassle. But a small bumbershoot like this one from Lily Pulitzer would fit in your bag, and might save the day during a heavy downpour. A happy light. During winter and early spring, the days can be long, dark, and gray. Sometimes a little portable light therapy is a must have, and this one from Verilux provides a quick dose of sunshine on a cloudy day. Waterproof boots. The key to staying warm and happy is dry feet. These Sakroots Waterproof Rain Boots come in a bunch of cute patterns, and are a fraction of the cost of a pair of Hunters. A hot cup of coffee. Or in my case, hot chocolate, since I'm the only person in Seattle who doesn't like coffee. With over 1,600 coffee shops in the city, you won't have to wait long for a toasty beverage to warm you from the inside out. Seattle is a wonderful city to visit, no matter the season. As long as you're prepared, there's no reason for the rain to stop you from having a great time! Head over to Deena's at Shoes To Shiraz for her month in numbers and April Showers post. 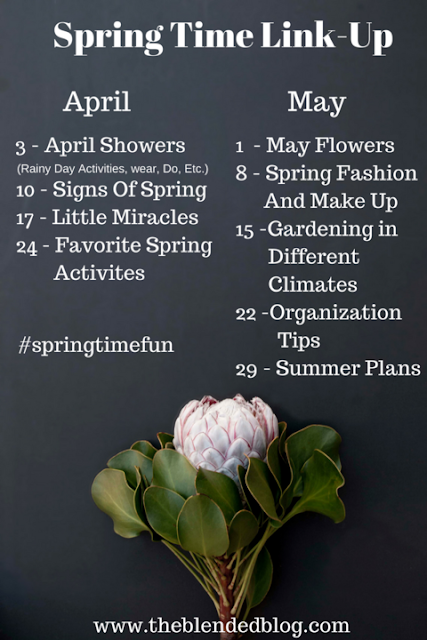 Join us and link up your Spring Time Fun below, and come back next week for Signs of Spring! I just admire you being able to live such a great life in such a rainy climate. I would really struggle with that. Love the portable light idea. I have to admit, the older I get, the harder it is. But there's not much alternative! I would really struggle living in a grey and cool climate. I complain about our weather here, but it's not bad at all in comparison. Love the portable sunshine, that is a must! Our summers are so wonderful, it almost makes up for the rest of the year! I seriously have none of this, except maybe a cup of hot coffee. I am so in for rainboots, a raincoat, and a happy light!! Even my umbrella broke over the weekend, although I'm sure we have other ones in the house. I love all of these, but I'm honestly so tired of using them this year! I'm ready for May flowers too! I agree - waterproof rain boots are a must on rainy days. Wet feet make me very unhappy! This is a cute post and theme! I never knew that portable lights like that were made! ha! I am sure it does help! I could use one when we have weeks and weeks of no sun here in STL at times! I have always wanted a cute raincoat! The happy light is a lifesaver for me! I have a happy light and it really makes a difference in the winter! I have never had a raincoat. Is that weird? No - but you have plenty of snow coats! I agree - I rarely use one, unless I'm going to be outside for a long time! You are the pro at rainy day stuff! I own an umbrella but that's about it. No coat. No boots. I'm not a pro by choice unfortunately! Interesting read. 38" of rain!! Wow. And 1,600 coffee shops to ward off the rain's chill. Crazy. I have heard of happy lights and really thought about buying my mom one at one point. Might keep that in mind for Christmas. And the rain is still falling! Sigh.